Look at our accommodation and find our online offers! Situated in the new, intimate and exclusive location of Corte San Mattia, just 300 meters away from the main entrance and reachable both on foot and by car, the "Cantina" Rooms are close to our renovated winery. The rooms are appointed with a private bathroom with shower, wi-fi, tv, air conditioning/heating. To eat breakfast or benefit from the main services, guests can either walk or drive towards the reception desk next to the main entrance. Situated in the new, intimate and exclusive location of Corte San Mattia, just 300 meters away from the main entrance and reachable both on foot and by car, the "Fruttaio" Rooms are close to our renovated winery. Situated in the new, intimate and exclusive location of Corte San Mattia, just 300 meters away from the main entrance and reachable both on foot and by car, the "Vigneto" Room is close to our renovated winery and overlooks the vineyard and olive trees. The room is appointed with a private bathroom with bathtube, wi-fi, tv, air conditioning/heating. Located on the panoramic garden a few steps away from the reception desk and main services, Garden rooms feature a simply and rural look. From the French doors, you can access a courtyard from which you will be able to admire Verona’s romantic historic centre and the river along which the city has thriven. Garden rooms are fitted with a bathroom with shower, wi-fi, tv, mini bar, air conditioning/heating, electric kettle, a set of teas, herbal infusions and instant coffee. From the external courtyard, where guests can chill out on comfortable chairs during the peak season, you can easily access the restaurant’s scenic garden and terrace. Located a few steps away from the reception desk and the main services, nearby the vegetable garden, where the vegetables we serve at our restaurant grow throughout the peak season and citrus trees flourish during the year’s coldest months, the Vegetable Garden Rooms feature a simple and rural look. Looking out over a small internal patio, the rooms come with a private bathroom with bathtub/shower, wi-fi, tv, mini bar, air conditioning/heating, electric kettle, a set of teas, herbal infusions and instant coffee. From the room courtyard, you can easily get to the main garden with a bird’s eye view of the wonderful city of Verona. Located on the panoramic garden a few steps from the reception desk and main services, the Arbutus Room features a simple and rural decor and comes with a comfortable and small kitchenette along with a table to eat at lunch and dinner. From the French doors, you can easily access to the patio where you will be able to admire Verona’s romantic historic centre and the river along which the city has thriven. This room is equipped with a private bathroom with shower, wi-fi, tv, mini bar, air conditioning/heating, electric kettle, a set of teas, herbal infusions and instant coffee. From the external courtyard, where guests can chill out on comfortable chairs during the peak season, you can easily access the restaurant’s scenic garden and terrace. Located a few steps from the reception desk and from the main services, opposite the Sassafras courtyard on the internal side and with a wonderful scenic view of the external side, the Climbing small house is composed of a bedroom, a bathroom with shower, a furnished kitchenette and a spacious living room with sofa bed, table and chairs. It also features wi-fi, tv, mini bar, air conditioning/heating, electric kettle, a set of teas, herbal infusions and instant coffee. From the house’s independent entrance, graced with the wild grape’s greenery, guests can easily reach the restaurants and the equipped scenic terrace with a view of the wonderful city of Verona. Located a few steps away from the reception desk and from the main services, opposite the Sassafras courtyard on the internal side and with a wonderful scenic view of the external side, the Lavanda Cottage is composed of a bedroom, a bathroom with shower, an equipped kitchenette and a roomy living room with sofa bed, table and chairs. It also features wi-fi, tv, mini bar, air conditioning/heating, electric kettle, a set of teas, herbal infusions and instant coffee. From the cottage’s independent entrance, blessed with the wild grape’s greenery, guests can easily reach the restaurant and terrace with a view over the wonderful city of Verona. Located a few steps away from the reception desk and from the main services, opposite the Sassafras courtyard on the internal side and with a wonderful scenic view of the external side, the Gate Cottage is a real highly comfortable apartment with independent entrance composed of two bedrooms, one of which double and one featuring 3 single beds, a bathroom with shower, a spacious living room with a furnished kitchenette and a relaxation area with a view of the valley and the city; it also features a wi-fi, tv, mini bar, air conditioning/heating, electric kettle, a set of teas, herbal infusions and instant coffee. Located a few steps away from the reception desk and from the main services, opposite the Eastern part of the scenic garden, the Tower Cottage is the largest accommodation we offer. Its three bedrooms, one of which situated in the tower, offer an eagle’s eye view embracing the surrounding countryside till Verona’s historic centre. Laid out on three floors with independent entrance, it is appointed with two bathrooms, one of which featuring a shower and a Jacuzzi, a furnished kitchenette, a living room with chimney and comfortable sofas, a dining room, air conditioning, heating, wi-fi and tv. Located a few steps away from the reception desk and from the main services, at the Eastern part of the scenic garden, the Small Tower Cottage is a tiny and gracious rural apartment laid out on three floors. 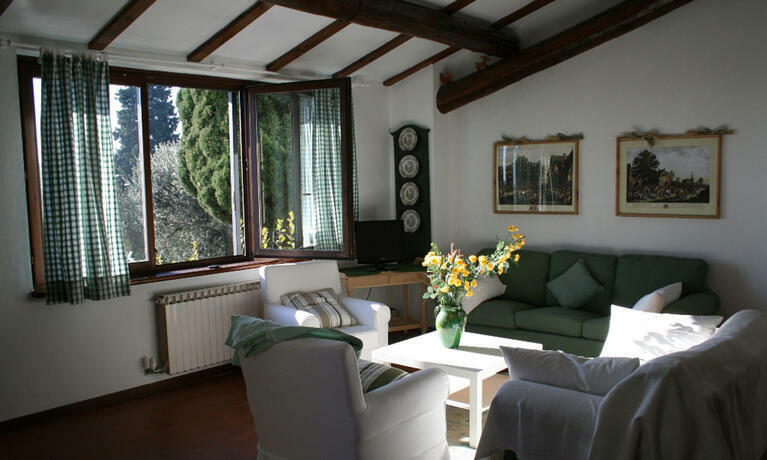 On the ground floor, it features a private external terrace/patio; inside is a furnished kitchen and a living room; on the first floor is a small living room with a double sofa bed; on the second floor is a bedroom from whose windows you can marvel at the view of Verona’s romantic historic centre. 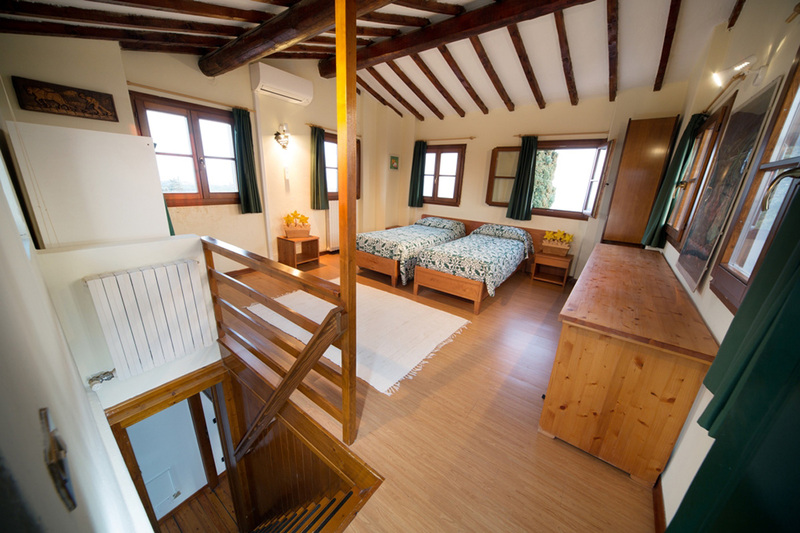 The Small Tower is equipped with heating and air conditioning, wi-fi and tv. Situated in the intimate and exclusive location of Corte di San Mattia (San Mattia’ Court) just 300 meters away from the main entrance and reachable both on foot and by car, Locandina rooms enjoy a privacy that make them unique and intimate. From the French doors, you can marvel at the romantic panorama over the sweet hills of Verona. 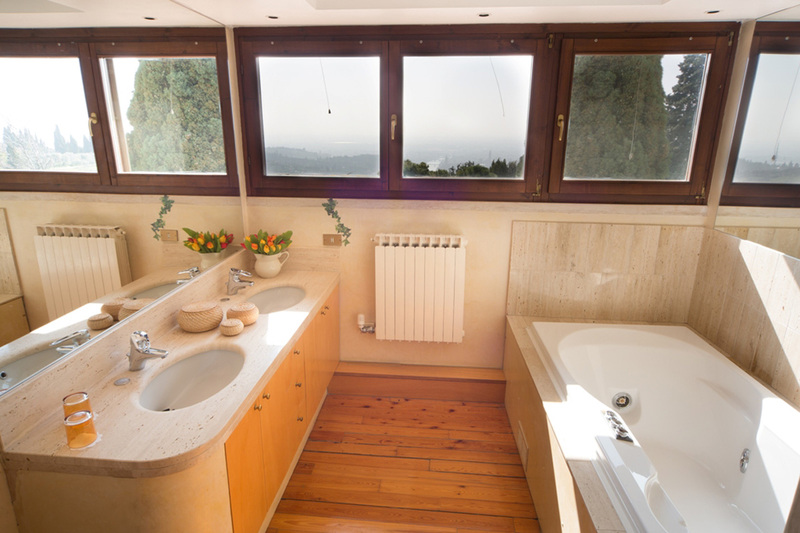 “Locandinas” are appointed with a private bathroom with bathtub/shower, wi-fi, tv, air conditioning/heating. At the building’s main entrance, two communal areas unfurl featuring a living room and a game/reading table on the right hand side and a kitchenette with a small-size dining room on the left. At the centre, the stairs lead to the bedrooms. Situated in the intimate and exclusive location of Corte di San Mattia (San Mattia’ Court) just 300 meters from the main entrance and reachable both on foot and by car, Mimosa rooms enjoy a privacy that make them unique and intimate. 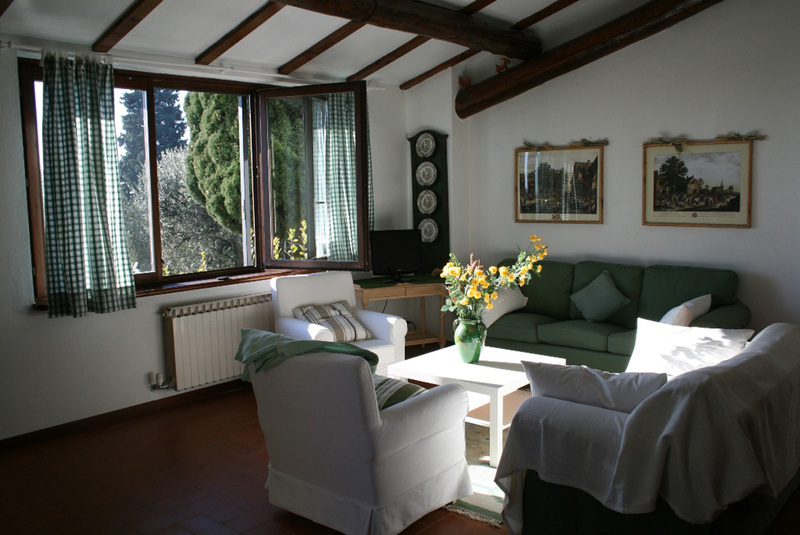 From the French doors, guests can admire the romantic panorama over the hills of Verona and the city’s historic centre. 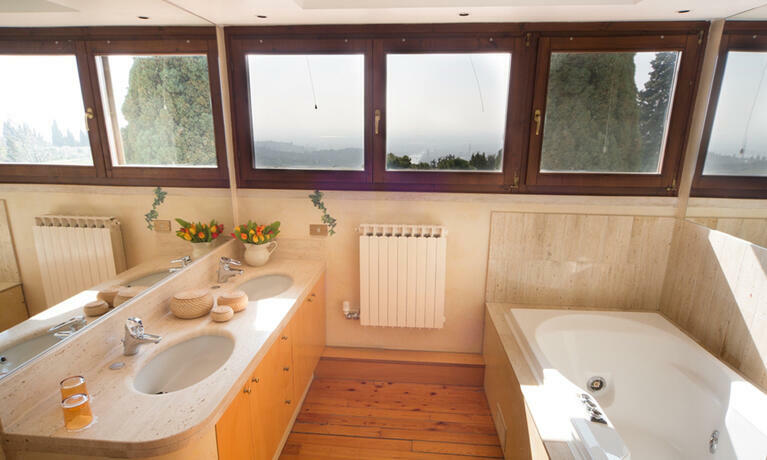 “Mimosas” are appointed with a private bathroom with bathtub /shower, wi-fi, tv, air conditioning/heating. At the building’s main entrance, a spacious communal living room/reading corner opens up whereas on the right hand side the stairs lead to the bedrooms and a small room featuring a communal furnished kitchenette and living room. Outside of the building is a patio with tables and chairs to chill out during the peak season. To eat breakfast or benefit from the main services, guests can either walk or drive towards the reception desk next to the main entrance. Situated in the intimate and exclusive location of Corte di San Mattia (San Mattia’s Court) only 300 meters from the main entrance and reachable both on foot and by car, Stia House enjoy a dedicated parking lot within the court and a privacy that make them unique and intimate. From the French doors, guests will have a chance to marvel at the romantic panorama over the hills of Verona and the city’ historic centre. 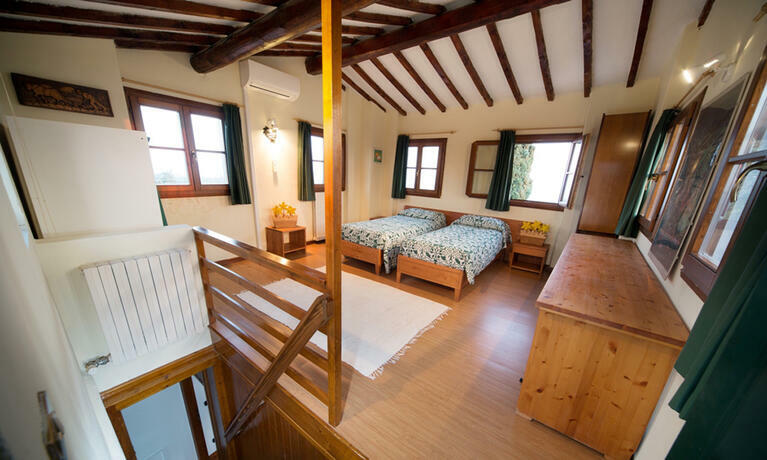 Located on the ground floor of a rural farmhouse, Stia Houses are composed of a dining room with a rustic kitchen, a living room with double bed, a small bedroom with a single bed and a bathroom with shower, wi-fi, tv, air conditioning/heating.